If you’re one of the millions of Americans who wear dentures, you know that they’re a game-changer after losing teeth. Dentures restore more than just your ability to eat and speak: They also restore your self-confidence and allow you to live your life to the fullest! But as with any other dental procedure, your overall experience depends on several factors. First, your dentures in Bloomfield Hills must be made well from the start so that they look and feel great. Second, you have to establish basic care and maintenance habits. This not only helps them last as long as possible, but it’s also crucial to your oral health. If you’d like some of the best oral care tips for denture wearers, learn more in this blog! How Should You Care For Your Mouth When You Have Dentures? It’s easy for people to think that they don’t have to invest much time into a hygiene routine once they’ve lost their teeth, but that’s simply not true. Make sure to gently but thoroughly brush all the soft tissues in your mouth each morning and night, including your tongue, gums and the roof of your mouth. This daily task will remove plaque and bacteria from your tissues and keep them healthy. What’s the Best Way To Maintain Your Dentures Themselves? Make sure to handle your dentures over a soft hand-towel or basin of water. They can easily break if they’re dropped! Even if you soak your dentures, it’s still important to brush them each day. The mechanical action of your toothbrush bristles will do more to keep them clean than soaking will. Always keep your dentures moist, because they can be more prone to cracking or breaking if they dry out. If you notice any chips, cracks or bends in your appliance, schedule an appointment with a dentist in Bloomfield Hills. Avoid trying to fix any issues yourself, which can cause more harm than good. Finally, since the shape of your jaws will naturally change over time, it’s recommended that you see a ‘dentist near me’ at least once a year to stay on top of these changes. That way, any necessary adjustments can be made to your denture so that it continues fitting (and feeling) great. Dentures are a wonderful way to restore your ability to laugh, smile, speak and chew with ease. With these tips and tricks, you’ll be able to enjoy these benefits for as long as possible! Dr. David Banda is a dentist in Bloomfield Hills who loves restoring his patients’ quality of life with dentures that look and feel great. 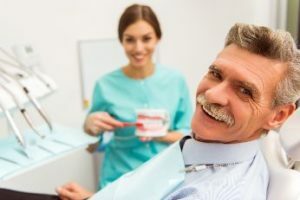 He knows that the right maintenance is crucial to a good experience, so he always educates his patients about how to best care for their dentures. If you have any questions, he can be reached via his website or at (248) 647-5434.
by: Dr. David Banda at August 3, 2018 .